Yesterday (latest in the season ever — see interesting articles in the New York Times last month about Thoreau as a climatologist) I spent the morning bringing all my tropical plants inside. Part of the reason it was later is that I have learned that the orchids and night-blooming cyrius like nights in the low 40s and can tolerate the occasional single night in the high 30s, but most of it is that it is a warmer season than any in the decade I’ve had a significant number of tropical plants. I also bring inside the lemongrass and lemon verbena (annuals here; perennials where they are native). I also like to bring in rosemary in a container. Also, what were once small plants in growers pots are now a huge jasmine and a bay tree. When I bring all of this inside in the winter, I transform the house into a retreat. When I bring it all outside in the early spring, my tiny yard is full and lush before the annuals start flourishing. Once the tropicals were all inside, I cleaned up, tended the beds and containers, and strew some more winter kale and baby spinach seeds (no frost in the forecast for the next 15 days — so I could have new kale and spinach through December; also, some of the seeds will wait and be the early ones that come up during that warm week we always have in February). Putting the garden to bed has a sweetness to it. I prepare for next year, but also engage in tending what will flourish best when the days are coldest and shortest. It is a going inside, knowing that there is a need to go inside and let some things be dormant in order to flourish fully when the sun is bright and hot and calls me outside. This type of gardening is stressful for the lower back, hips, and shoulders. Throughout the hours I am gardening, I like to engage my alignment by intermittently doing some poses, strongly integrating my shoulders, hips, and core: working strong “shins in/thighs out” I practice uttanasana (standing forward fold), utkatasana (chair pose), and adho mukha svanasana (downward facing dog), and maybe even handstand. It is critical to make sure not just to bend from the knees, but also to make sure you have a good lumbar curve and your tailbone is tucked, when picking up containers or other heavy objects. 2. Balasana (child’s posture) with arms stretched out, palms, forearms, and armpits lifted. Inhaling lift underside of arms to strenthen, exhaling soften between shoulder blades to integrate. 2. Chakra vakrasana (cat/cow breathing). 3. (putting the garden to bed sun salute): Table pose (if you make sure you have good lumbar curve, table is one of the best postures for making sure hips, back, and shoulders are aligned well); Downward facing dog (play in the pose to integrate and stretch the legs and arms and strengthen your core); Palakasana (plank);Table pose; Balasana;Table. Repeat the series several times. Add in lunges (coming into the lunges from table). Add in twists from table, threading one arm through and coming down onto that shoulder). Add in pigeon pose (with a forward bend). 4. End with legs up the wall, a supported or seated forward bend or two, and savasana. Enjoy how this practice nourishes and realigns, but generally draws the attention inside, getting you ready to enjoy the inside while waiting for the next growing season. ps While I was practicing, I had a big vat of tomato sauce cooking from the last (perhaps second to last) harvest of cooking tomatoes. Now the real work begins! That is what President-Elect Obama, the headlines, the pundits, the commenters, all said, hardly pausing to savor “victory.” Unlike 1992, no one is suggesting that it is now time to party like it’s 1999. I am elated by the result, but personally most encouraged by the earnestness of the reaction, the call for selflessness and effort to begin. In yoga, one of the primary practices is seva or selfless service. I think a critical aspect of seva is joyousness. This is not a call to knuckle down soberly as a puritanical denial of pleasure. Rather, it is a call to discover the pleasure in giving of oneself without asking anything in return. I begin, this morning, by giving financial support to certain groups that are hard at work to end war and torture and support the environment, but in dire need of support because of the financial crisis. I have celebrated this morniong with heart-opening asana, and plan to take a lunchtime walk in the neighborhood and prepare delicious food from the garden, while most of my day will be devoted to working and teaching. Each day, as this new path opens and work continues, I will strive to remember the words of Hafiz: “[Spirit illuminates] the affairs/ Of the whole universe /While throwing wild parties/ In a tree house — on a limb / In your heart.” (The Subject Tonight is Love, 60 Wild and Sweet Poems of Hafiz, Versions by Daniel Ladinsky). I was first taught that adhikara meant “studentship.” Although that is not a literal translation, adhikara implies a dedication and steadiness in the student that makes the student worthy of receiving the teachings (of yoga). As I was steadying myself during this momentous time and working in the garden, I was thinking about how the principle of adhikara applies to so many aspects of life, including gardening and being a citizen. One of the literal translations for adhikara is “competence.” What is the competence one needs to have in order to participate in the study? As I harvested the last of the peppers and eggplants and pulled up the plants, making room to sow another round of greens (not too late in my sunny, protected yard in the city), and decided to leave the orchids out for another week, I thought about how I knew what to do when in my garden. By being present and observant for two decades in my yard alone, I have grown competent to know what will likely grow in my little patch of earth and for how long into the season, depending on the year’s weather. My initial competence, when I started this garden almost 20 years ago, was some basic training in other gardens, reading technical books, and enthusiasm. My consistent efforts to learn yielded results delightful to me from the beginning. As I have continued my studentship in the garden, my appreciation grows. The same is true for me also with cooking, relationships, and my participation in the community (not necessarily in that order). The fundamental competence of a student is having the basic skills to participate at the level of the teachings. For a gardener, it is recognizing our climate, our space limitations, and our soil, and being open to learning what can be changed in a particular space and what must be accepted. For a citizen, it is knowing basic civics, what are the most relevant issues for us and society at large, and what we can change and what we must accept (I think knowing the subtle differences between what we can change and what we must accept is incredibly difficult). For yoga, it is much the same: we must know what are true limits and what are false ones and be consistently present, practice steadily, and be ever open, not only to studying, but to the fruits of study (expected or not). I cannot change the weather, nor guarantee how other voters will vote, but I can continue to maintain the adhikara necessary to be a fully engaged student of this life on all days and not just the days it is fun or gratifying. The yoga, on a day like today, is to act fully, accepting, and perhaps even appreciating, the limits on what I can control. It’s no surprise: I find myself more and more consumed by thought and activity regarding the state of the country and what I can do as a citizen (including voting) to make things better. As I seek to stay engaged, but grounded and without anxiety, I find solace of the teaching in the Bhagavad Gita that true yoga is action without attachment. To be detached is not the same as withdrawing from action. In fact, the Gita suggests that the path of action is better than the path of renunciation. What is actionless action? Given the Gita’s fundamental premise that we must act in accordance with our duty (what that means is the subject of much debate that is beyond a simple blog), actionless action does not mean disengaging from the process. It also does not mean not caring. Rather, it means that we should act fully in accordance with our principles (which principles should be shaped by the yoga guidelines of non-harming, truthfulness, non-stealing, alignment with nature, non-greediness, cleanliness, contentment, fervor, self-study, and surrender), but with the mental understanding that we are ultimately not in control of the outcome. We act because not to act is a cop out. We offer the fruits of our action to forces beyond ourselves. We act out of love — not selfish love for personal gain — but with loving gratitude for being able to act at all. We engage fully and then still seek to be free of being unsettled by either pleasure or pain from the outcome. Whatever the results, we keep acting, we keep doing our duty, fully and with loving engagement. P.S. I will have voted in the morning and will be teaching at Wm Penn House on Tuesday so come join me resting in yoga before going home to watch the returns. Each Willow Street session, I choose an overall philosophy topic or book to inform the themes for my classes. I choose them based on something that I believe is relevant to what is going on in the world, something that has captured my interest, or something that I believe supports the growth of the groups of students attending my various classes. When exploring particular readings for this purpose, I do more than read. Rather, I contemplate, journal, practice asana (in a sense choreographing the philosophy using the principles of alignment), and meditate with the reading in mind. Paul Muller-Ortega calls studying by going beyond book knowledge and continuously contemplating, refining, and exploring its living meaning for us is vikalpa-samskara — the practice of study. (Siva Sutra Pravesana, An Introduction for Practitioners of Yoga). This session, the central text I am reading is Swami Chidvilasandana’s The Yoga of Discipline. The book contains a series of lectures discussing how being steady and constant in our yoga practice (including bringing yoga principles to our daily lives) will help us become more gracious, happy, and able to serve society. The lectures draw on teachings from the Yoga Sutras of Patanjali and from the Bhagavad Gita (suggested translations in another blog entry to come). I am freely drawing on those as well, even those sections not discussed in The Yoga of Discipline. I picked this text at this time because I am feeling such a deep need and such gratitude for my yoga practice, study, and community in this time of uncertainty. It has been my own personal experience that longer I have had a steady practice, the better able I am to come from a place of light in times of flux, pain, or complexity. Last year, when it was dry and hot early, I had an extraordinary season of peppers, tomatoes, and cucumbers. This year, the peppers and cucumbers were not particularly abundant. The heat came too late and the rain has been too inconsistent for them to thrive. The eggplants, though, were ecstatic this year. Every week brought at least two and sometimes four. When cooking for one, it is easy to find two eggplants a week far too many. It was a relief to go to Santa Fe, where I could eat seasonal vegetables that did not include eggplant. I was delighted, though, knowing I was about to host a party, to come home to five eggplants almost ready to be picked. What better base for a potluck party dish than eggplant? Knowing the crowd, I anticipate baba ghanoush by the bucketful; could not make that. The tomatoes are not longer succulent enough for caponata (they must all become sauce); that was out. I chose, then, eggplant caviar. Not a bad pick. What could be a better offering for a party in Washington DC at this time in history than what is often called poor man’s caviar? I do not know the historical basis for it being named poor man’s caviar. It does not look like caviar. Not really. It does not taste like caviar. You can put it on bread or crackers the same way you would serve caviar, but that certainly does not further the explanation. It is, though, a delicious and festive dish that pretty much requires only having eggplant growing in the backyard (or a trip to the farmer’s market) and the time to take care of it. Take 3 to 5 eggplants, depending on size of eggplant and number of portions desired. Cut them in half, score the flesh and salt it. Let the eggplants drain cut side down, weighted by a heavy plate or pan, for 45 minutes to an hour. Rinse and squeeze out the eggplant. Roast, cut side down, until very tender. (In my convection oven, that’s about 25 minutes at 350F). When cool enough to handle, scoop out flesh and chop coarsely. Drain again in a strainer for 10-15 minutes. Meanwhile, wisk together olive oil, pressed garlic cloves, and dijon mustard to taste (to be local, you could use walnut oil, and it would taste excellent; I expect, however, that there may be party guests who are allergic to nuts). Squeeze out the eggplant pulp and mix it with the remaining ingredients. Best if sits overnight or at least a few hours. When ready to serve, adjust the salt and pepper. Variation Make with mushroom. Skip right to roasting (or even just mince finely and saute until juices evaporate). I just came back from a wonderful week in Santa Fe, studying therapeutics with John Friend. It was most wonderful to be among friends with a shared passion for nurturing and healing through yoga, all of whom are deeply committed to continuing intense study. It was also delightful to be in a beautiful place, away from the cares of the day to day. Although I have many friends from around the country I have met on previous study trips, I found that I spent the most time outside of class with fellow teachers from Willow Street. It was not because I know them best and it was expedient for me as a person who is by nature introverted to stick with people I know better, but rather because when we are home, we all are fully engaged in our daily lives and do not have much time to see each other. That we need to go away together to be free to see people close to us is a mindset that I am working to shift. If I have time to go away for a week, then I should be able to make time to see someone for lunch or tea. How do we make this shift? Part of it is just a conscious recognition that we need each day to pause and reflect, to make time to connect to our own spirit and to our home community. Living this way will not diminish the joy of going away, but it will make us more grounded and rested at home, while we are working. We will work better, be happier on a day to day basis, and be better able to serve. Yes, this is another aspect of enriching life by simplifying. Viveka means discrimination. Being able to recognize the meaning of what we do and what are the potential consequences of our actions is an important aspect of our yoga practice and our lives. Living discriminately does not mean that we reject what is pleasurable. Rather, it means that we recognize the consequences to ourselves and other beings when we partake of the fruits of the earth and the labors of others or choose one activity over another. We think about whether it makes sense and then, once having decided, we fully engage and enjoy and don’t beat ourselves up after the fact. If we think we made the wrong decision, we choose differently the next time. How does viveka relate to the Carbon Fund? The Carbon Fund’s motto is “reduce what you can, offset what you can’t.” I replace “can’t” in this phrase with “choose not to,” as what we think we must have (in this society generally) does not necessarily correlate with what we actually need to survive. Otherwise, all we’re doing is throwing a little money as a superficial balm without thinking through with discrimination. When I think about what I can reduce, and what I choose not to in terms of my carbon footprint and my overall lifestyle, I am struck by the irony that my biggest carbon footprint after heating and cooling my house is plane trips to John Friend yoga trainings. It would be disingenuous to think that I can’t not go to Santa Fe next week. I do not think, however, it makes sense to shrink our lives to the point that we are not engaged in society and that we do not relish the opportunities we have, just to feel good about diminishing our impact on the environment. Studying and practicing Anusara yoga all around the country, getting to know the wider kula and establishing a greater sense of connection while deepening my knowledge and experience of the practice continues to be wonderful and joyous for me. So I choose to go, and I anticipate having a great time next weekand bringing back great things to share with all of you. And I’ve gone to Carbon Fund’s website and offset my trip and then some. And I think about other ways to reduce what I can. Tonight I will teach my last class at CHY’s current space after having taught nearly every Wednesday night for 5 1/2 years. I am deeply grateful to Marianna, Leyla, and Julie for having pulled together the community and continued yoga in the space when Dancing Heart moved, and to Stacey for joining them and keeping the fire brightly burning. 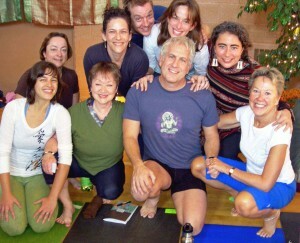 I feel deeply fortunate for having been given the opportunity to teach at CHY while I went through my teacher training. I am also deeply thankful to all my CHY level 2 students who went through the Anusara certification process with me; the class that led to my ultimate certification was taught at CHY on the 10th anniversary of Anusara yoga. I extend my gratitude to all the students who were with me on this path of expansion, exploration, and delight and who have taught me so much and shared of their hearts. Although I feel a profound sense of loss with the Stanton Park studio closing — how will I know when to end class without Wilbur the dog letting me know it is time to end savasana? — I look on this as an opportunity for the community to coalesce in new ways, and for each of us to deepen the community and our practices. I regard all of you at CHY as my friends, as well as students and neighbors, and look forward to seeing you in yoga classes on the Hill in new spaces and at other events in the neighborhood. Welcome to Rose Garden Yoga’s website and blog, my place in the ether to share my thoughts on yoga, philosophy, and feeding mind, body, and spirit. Please sign up for my mailing list to stay up to date on my classes, workshops, and events by signing up for my mailing list. Just enter your email address.